A new study, published in the journal Biological Conservation, has found that a quarter of pregnant sharks, skates, and rays lose their pups when fished. Since shark fishermen target pregnant females, which are the biggest sharks, this reveals that shark fishing is responsible for many times more dead sharks than Fisheries data indicates. The lead researcher, Kye Adams, a PhD student at the University of Wollongong, said that shark fishermen should be made aware of the danger of inducing abortions in pregnant sharks, rays, or skates. So far, the loss of the young aborted by fished sharks has been ignored by both science and fishermen. Adams said, "It's quite prevalent across a lot of species and also seems to be not well known by both researchers and recreational fishers. "They don't realise these events are abortions, they think they are witnessing a natural birth." The research found that recorded instances of sharks and rays undergoing a premature birth after capture found that 24% of pregnant females from 88 species aborted their offspring. However, in some species, including the pelagic stingray, 85% of pregnant females lost their young. The research found stress to be the main cause of the trauma induced abortions, but Adams had not been able to determine whether the abortions were the result of physical trauma, such as being stabbed by a harpoon, fished on a hook, or trapped in a net, or psychological stress. In Australia, about 80% of fished sharks are 'released' after being captured. Adams suggests that fishermen release the shark without raising it from the water, by just cutting the line at the shark's mouth. However, such a solution does not address the question of the ethics involved in leaving a large wild animal with a hook in it, never mind whether such blood sports should be tolerated at all in a moral society. "Feeling good about tagging and releasing sharks was folly. The cheaper hooks bought by the weekend warriors were more often than not swallowed by the sharks which then fought their final battle gut-hooked. After being released, most sank to the bottom, dead. Maybe two out of twelve are hooked in the mouth. Add it up along the coast." Sharks are not trout. They are large animals that have to swim continuously forward just to keep an adequate supply of oxygen moving over their gills. Their strong horizontal undulations are like a heartbeat, a powerful automatic motion they cannot stop. Their desperate efforts to escape death while pulling with so much force against a big shark hook piercing their faces or internal organs, causes serious internal and facial injuries that are usually mortal. That they spontaneously abort is not surprising. With the news that shark fishermen are responsible not only for the death of the shark they have hooked, but also for all of its young, puts the shark mortality from fishing many times higher than the records show. Yet the official records minimize shark mortality, since three quarters of sharks and rays killed are not recorded, and are discarded at sea. When fishing slaughter began among the sharks this writer studied in Tahiti, the entire community fled, and it never reformed as it had been. Those who had escaped being landed first appeared swimming unsteadily, and more weakly than sharks within 24 hours of death from natural causes. They displayed the same symptoms of pain seen in birds and mammals: they were less alert, less responsive, and they swam slowly, erratically, and often as if they were off-balance. The recovery of their normal swimming pattern when they lived, took up to two weeks. 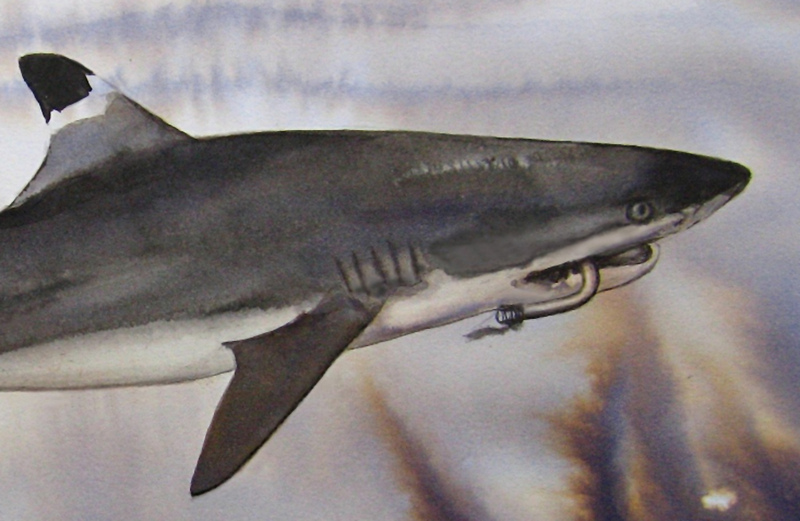 Large hooks remained stabbed into their mouths and often into the jaw itself, where they interfered with the sharks' ability to eat. Some lost weight and died in the next months. The hooks took weeks, and in some cases months, to rust out. Sharks appeared during this time trailing lengths of fishing line that had become covered with algae to a thickness of several centimetres. Some continually jerked their heads away from the drag as if the heavy weight pulling on the hook in them was a steady source of discomfort. Juveniles appeared exhausted by it and disappeared before losing the hooks. Some females aborted, though due to the magnitude of the slaughter, it was not possible to determine how often they did so for most soon disappeared. With sharks at less than ten percent of their former levels, it is time to rethink whether they should be made available for the amusement of the brutal elements of society at all. Laws have been passed to protect the innocent in other cases. In most countries it is illegal, for example, to fight dogs and birds to death. Sharks, too, should receive protection in the interests of continuing to build a moral society, as well as for the health of the ocean, and trade in their parts should be banned by international law.